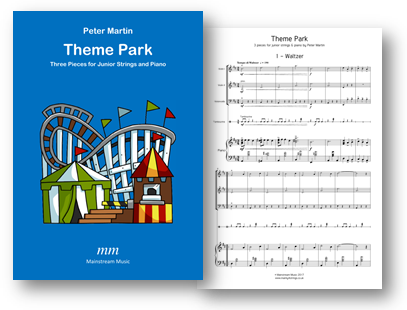 A short, flexible suite in three movements, featuring musical representations of three ‘theme park’ rides. The PDF contains melody parts for viola and cello, a viola part doubling that of the violin II part and a part for double bass. When used with less experienced players, the piece can successfully be performed omitting the violin I/melody part. The backing tracks include a slowed down version of the last movement. Click here to listen to a recording of the piece. Click on the image below to view the score.